Sweden-based Nordic Alarm recently chose to integrate Idesco’s MIFARE readers with their comprehensive security system, Nordic Integral. A leading security system supplier in their home market, Nordic Alarm serves diverse sectors of corporate security from access control to CCTV and found Idesco’s readers, in both Quattro and Slim Pin housings, nicely complemented their own product offering. ”We’ve been co-operating with Idesco’s skilled engineers for a long time, with good results. We are particularly pleased to embed Idesco’s elegantly Finnish designed, energy-efficient readers into the integrated system we provide our own customers”, stated Nordic Alarm AB’s business unit manager Integral, Claes Hafström. Besides the readers’ technical flexibility, Nordic Alarm was impressed by their durability and reliability in harsh, Nordic conditions. End-users especially appreciate the appealing design and usability of the readers, for example the easy-to-use back-lit keypad which is helpful in the dark. ”We already have a long experience of supplying advanced readers for various access control, vehicle identification and logistic applications in Scandinavia. 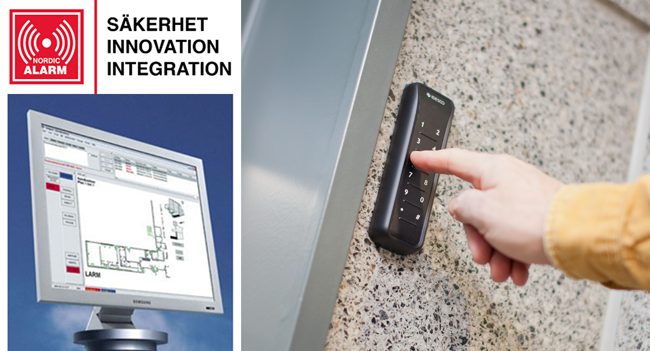 Nordic Alarm and their Nordic Integral system are well-known names in the access control business. Our cooperation with Nordic Alarm has been a major component of our strong growth in Scandinavia”, says Jens Holmberg, business manager Scandinavia from Idesco. Nordic Alarm is protecting tangible and intangible assets by providing advanced security systems that integrate intrusion protection, access control, CCTV and personal protection. Internal product development infused with high IT competency have provided Nordic Alarm a unique position in the security market, making the company one of Sweden’s leading suppliers of high security systems with customers including banks, the Swedish Prison and Probation Service, Swedish Police, hospitals, IKEA, Statoil, ICA, among others. Nordic Alarm is part of Lagercrantz Group. Idesco provides secure and scalable identification solutions crafted to meet the unique demands of your business. Idesco not only offer solutions in access control, automated vehicle identification and other industrial and logistics applications. We also excel in customizing scalable and versatile solutions leveraging a full spectrum of RFID technology benefits you can integrate into deployments of your own secure, cost-effective and user-friendly identification systems. We create identification solutions that can make your business run more securely, efficiently – profitably.